Koto-In is one of the sub-temples of Daitoku-Ji (大徳寺), and it was founded by a warrior named Hosokawa Tadaoki (細川忠興) in 1602. He was one of the 7 highest disciples (利休七哲) of Senno-Rikyu (千利休). 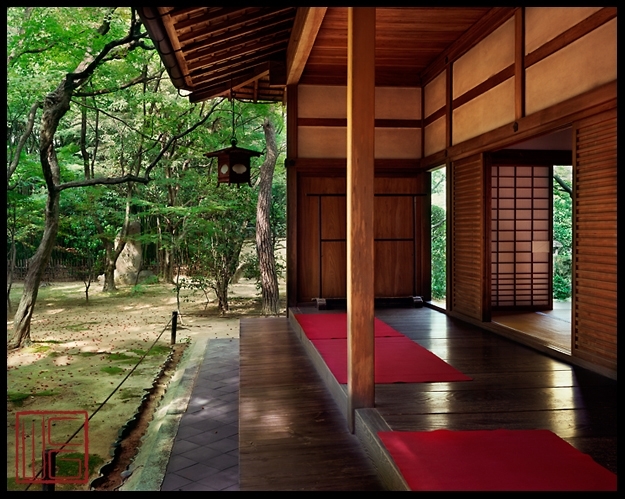 Rikyu was a master of the tea ceremony.As with many other Zen temples, one can feel at peace from being in this temple rich in simplicity surrounded by the simple garden. Such tranquil simplicity is captured well in this image. A single stone lantern is silently standing in the garden viewed between the openings.